For years I have been arguing that the case for an aggressive U.S. carbon tax is much weaker than its loudest proponents would have Americans believe, even if we stipulate the physical science computer models for the sake of argument. (For example see this IER post, and for longer treatments the studies here, here, and here.) A recent WSJ story on climate change policy beautifully illustrates my point. As I’ll show with just a few key excerpts from the article, the American public has been sold a giant bait-and-switch: Even taking the very projections and commentary put out by the pro-carbon tax scientists and economists, we can see that the political “solutions” don’t solve the climate change problem that is the supposed reason for implementing the massive new taxes and regulations. To repeat, we don’t have to be “deniers” to see that the official case for aggressive climate policy doesn’t add up; all we have to do is critically examine the commentary from the proponents themselves. The first trick in the bait-and-switch is to get the climate intervention in the door with “moderate” policies that will impose tolerable losses on the economy. 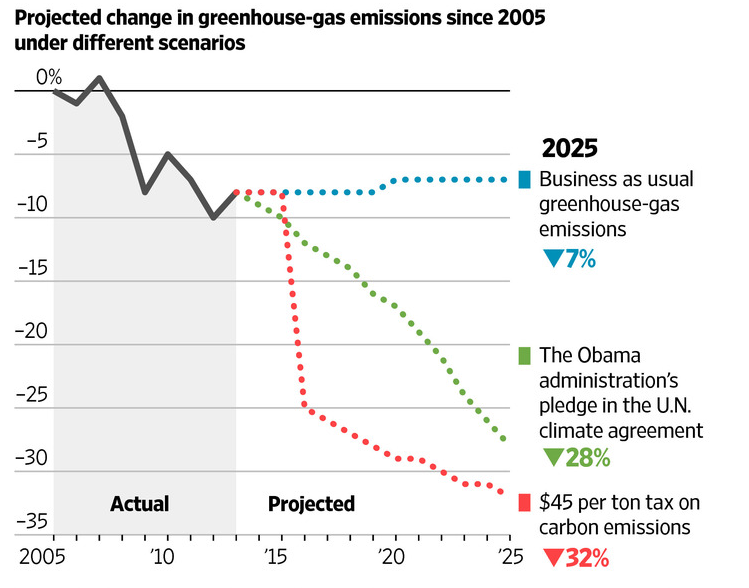 The following chart, taken from the WSJ article, shows estimate of U.S. emissions under three different scenarios: (1) “business as usual,” meaning no new policies, (2) the short-term U.S. pledge made in the recent Paris climate agreement, and (3) the impact of a $45 per ton tax on carbon dioxide emissions. SOURCE: Wall Street Journal, relying on EPA and Resources for the Future (RFF). Economists consider a carbon tax the most efficient approach to limiting carbon emissions. Modeling conducted by Resources for the Future, a nonpartisan think tank, shows such a tax could achieve Mr. Obama’s near-term target with only a small impact on the U.S. economy. A $45-per-ton tax of carbon dioxide, rising 2% above inflation each year, would make households worse off in 2030 by an amount equal to 0.45% of all household spending if the revenue were used to reduce corporate income taxes, or 0.79% if it were rebated back to households. Spread over 14 years, such a reduction would be almost unnoticeable. The price of electricity would rise 15% and gasoline prices would go up slightly less than 8%. There are several important things to notice in the above block quotation, and keep in mind I am going to stipulate the RFF estimates for the sake of argument. Even if their “optimistic” projections are correct, the situation is not nearly as rosy as the commentary suggests. First of all, it is not correct to take the impact of the tax in 2030 “spread over 14 years.” The RFF estimate says that in 2030 alone households will be worse off by the listed percentages. The cumulative damage to the economy is much higher than that, because the carbon tax would have been implemented earlier. In other words, the damage impact in 2030 is not a one-shot event; that is simply a snapshot estimate showing how much the conventional economy will be damaged in that year itself. Second, notice how implausible the 0.45% of household spending figure is: That is the estimated damage if all carbon tax revenues are used to reduce corporate income taxes. If, instead, all carbon taxes are returned lump-sum to taxpayers, then the damage impact increases to 0.79% of household spending, a whopping 75 percent increase in the economic cost. Think about that for a moment: We are still in fantasyland if we’re playing around with estimates of how badly the economy will suffer if all of the new revenues from a carbon tax are returned dollar-for-dollar as checks to taxpayers, rather than fueling a penny increase in federal spending. How can anyone take this seriously, when progressive groups are openly campaigning against revenue neutrality, and proponents of a carbon tax tout all of the necessary “green investments” that must go along with it? Further, if merely switching the form of revenue-neutrality—namely, from giving 100 percent of the revenues back to corporations via rate cuts, to instead sending lump-sum refunds to taxpayers—causes the economic damage to increase 75 percent in the RFF model, then what will happen in the real world, when much of the new revenue is devoted to more boondoggle projects? But there is a third, critical observation we must make concerning the allegedly “small” impact of the emission cuts shown in the above chart: Although they would meet the Obama Administration’s pledge under the Paris agreement, the Paris commitments do not put the world on a trajectory to limit global warming to 2 degrees Celsius. This is the goal that has swept the community of scholars and activists who endorse aggressive government intervention. And yet, to repeat, the “affordable” Paris commitments will not achieve this important goal, according to their own preferred computer models. Policy makers meeting in Paris last December agreed Earth’s temperature shouldn’t rise more than two degrees Celsius above preindustrial levels by the end of the century. The emissions cuts agreed to don’t actually limit the temperature rise to two degrees. But the nearly 200 participating nations—most of whom had representatives sign the agreement Friday at the U.N. in New York—hope further cuts in the coming years will. Now I hope the reader starts to see how the bait-and-switch works. Advocates of intervention throw out short-term goals that they can (with unrealistic and naïve assumptions) show will have a relatively small impact on the economy. This leads the casual reader to suppose that the nightmarish climate catastrophes of the future can be avoided at relatively affordable cost. A simulation using six different models suggests the world could meet those emissions targets if every country applied a carbon tax of $60 per ton by 2050 and $425 (in today’s dollars) by 2100. The result would be to reduce economic output by 5% to 10%. For gasoline alone, a $425 per ton carbon tax would translate into a $3.75 per gallon tax. Yikes! We’ve gone from a low-end 0.45% hit to household spending now to a possible ten percent hit to output. And remember, those smaller estimates were so modest because they didn’t entail the amount of emission cuts that the standard computer models say are needed to limit global warming to a “safe” amount (in the judgment of the interventionists). But wait, it gets worse. It’s not merely that the sticker shock is buried deeper in the article, and so the reader needs to dig in order to see just how expensive the true “solution” will be. Getting to Mr. Obama’s 80% reduction goal by 2050 is much harder. Economists are divided on whether estimates that far out are meaningful because so many factors, such as advances in technology, are unknowable. “We normally stop at 2030 or 2035 because it really gets so speculative,” said Resources for the Future economist Ray Kopp. Some clean-energy and climate experts say most economic modeling fails to predict technological revolutions that could make achieving deep carbon reductions possible. And there you have it. If we take the advocates of aggressive intervention on their own terms, stipulating their own models of the physical science and the economic impacts of climate change as well as mitigation policies to deal with it, we find that “affordable” policies will not actually solve the (alleged) problem. If we want to impose taxes and/or regulations to achieve the 2 degree limit that has become a standard threshold, the estimated impact will involve massive losses, perhaps 10 percent of output. And yet even this projection involves “science fiction” scenarios in which modelers must guess at the cost of various types of energy technology decades in the future. For years Americans have been lectured and brow-beaten with the mantra of “settled science” and anyone who challenged the official orthodoxy was denounced as a “denier.” Yet as this latest WSJ article shows, all we have to do is quote projections and commentary from various experts who support a carbon tax, in order to see that their case is alarmingly weak. The American people have been subject to a giant bait-and-switch. They are shown (unrealistic and naïve) cost estimates of modest, short-term goals to reduce emissions. Yet it turns out that these modest cuts don’t actually solve the alleged problem. In order to do that, much more expensive interventions are necessary, which most Americans would not endorse if they were imposed upfront. Finally, adding insult to injury, there is no guarantee that these draconian interventions would even “work”: At this point we are dealing with computer simulations of what will happen to not only the physical climate, but also the technological state of energy production, in the year 2100. In this absurd context, the “skeptics” are quite right to ask questions.